Hughes Network Systems, LLC (Hughes) has signed a contract for $190 million with OneWeb for the production of a ground network system, supporting OneWeb’s constellation of LEO satellites in their mission to bring affordable broadband service to millions of households, schools and other end users around the world. This contract builds on the original system development agreement between the companies signed in June 2015, bringing the total value of both to more than $300 million. The contract includes production of the gateway sites each with multiple tracking satellite access points to support operation and hand-off of high-speed user traffic between satellites. 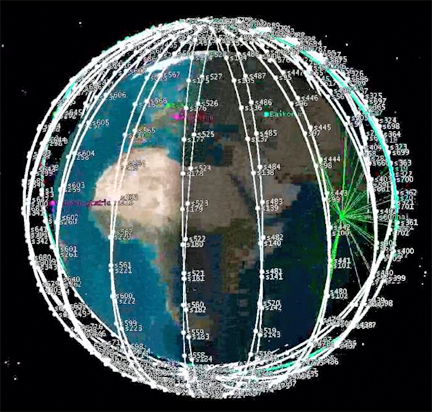 Artistic rendition of the OneWeb LEO Constellation. Greg Wyler, Founder and Executive Chairman of OneWeb, said that the start of production of the ground system is a major step towards fulfilling OneWeb’s goal of bridging the digital divide, leaving no one behind. Hughes has been an outstanding technology partner and the company is excited to deploy this essential part of the OneWeb network as the firm ramps up to launch the first of the fleet early next year and provide service to every rural home in Alaska starting in 2019. John Corrigan, SVP of Engineering for Hughes, added that designing a ground system capable of supporting hundreds of LEOs with seamless hand-off of broadband traffic between satellites presented a significant challenge. The Hughes team was up to the task, and the company is proud to be partnering with OneWeb on realizing this revolutionary satellite communications system to close the global digital divide.